I like that. thanks Robin. Thanks for the v3.2.5678 update. Actually I suspect that the bit order is now wrong, and that it was already correct in v3.2.5664 Previously the hot pixels (and amp glow) were at low light levels, but now in v3.2.5678 they are ahown at discrete high light levels (?) 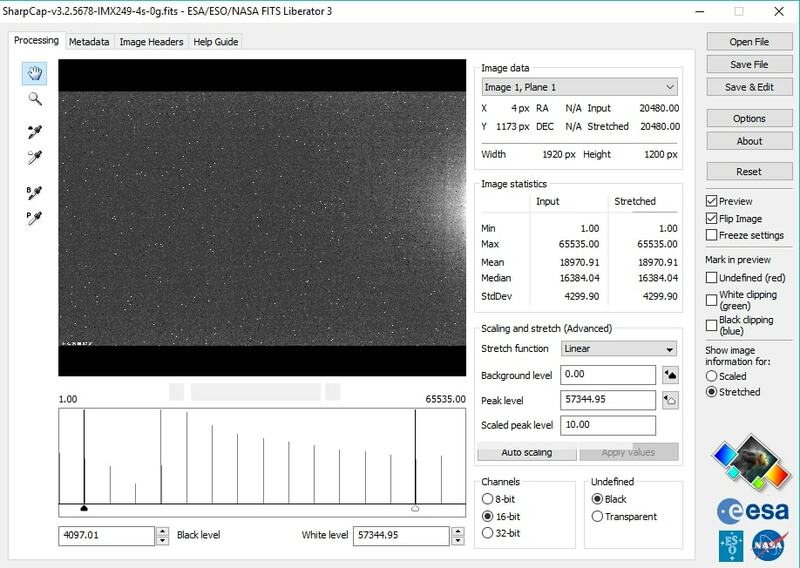 I have posted 4s 0-gain FLIR IMX249 screen shots and images, with names that may be self explanatory, first a screen shot, second a FITS Liberator analysis, and third the saved FITS file. Unfortunately I will not have my IMX249 camera after today, but hope that this might still help. Aargh, that was what I was afraid of. The byte order swap definitely helped with the camera i have, but that is a different sensor from a different manufacturer. I'm going to have to re read the documentation now to see if there is some way to find out the byte order for the current camera from the sdk. I am really enjoying the new features in the Beta and for the most part they work pretty good. My absolute favorite is the Folder Monitor Camera, though I might be using it in an unintended way! 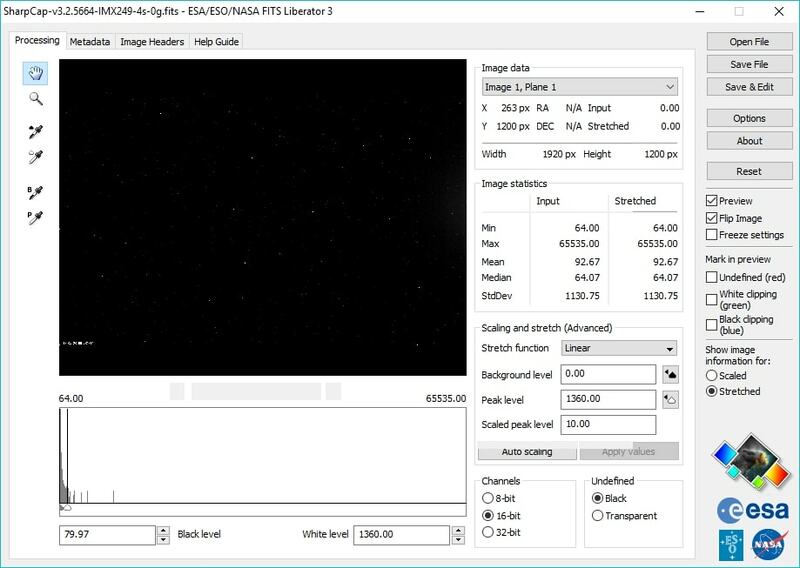 On my imaging computer, I like to set up my image sequences to be "hands off" and use Sequence Generator Pro. Then, periodically throughout the evening/night, on a regular interval, the files are transferred to my desktop PC in my nice cozy office and put them in a folder. I can then set that folder as the Folder Monitor Camera and run through the files quickly in a LiveStack to get a nice view of what's going on with my images. I have two bits of feedback, though. 2) I have an ultrawide monitor on my desktop PC and would LOVE to take advantage of the multimonitor support, but it doesn't recognize that I have that much space. Sharpcap gets spread out on my ultrawide, which is fine, but it ends up being a bit awkward with the LiveStack still on the bottom (by default) but VERY wide with lots of wasted space. I know I can "unpin" the livestack window, but it ends up being a cluncky solution at best. Not sure how the multimonitor actually works so I can't provide feedback on it and how to apply it in an ultrawide setting, but if there's a way to have your image view in a "separate" window from the main sharpcap menus and various settings windows that'd be what I'm looking for. As always, I really enjoy the program and all the new features are amazing. Next feature I'm going to attempt to use and provide feedback on is the dithering. 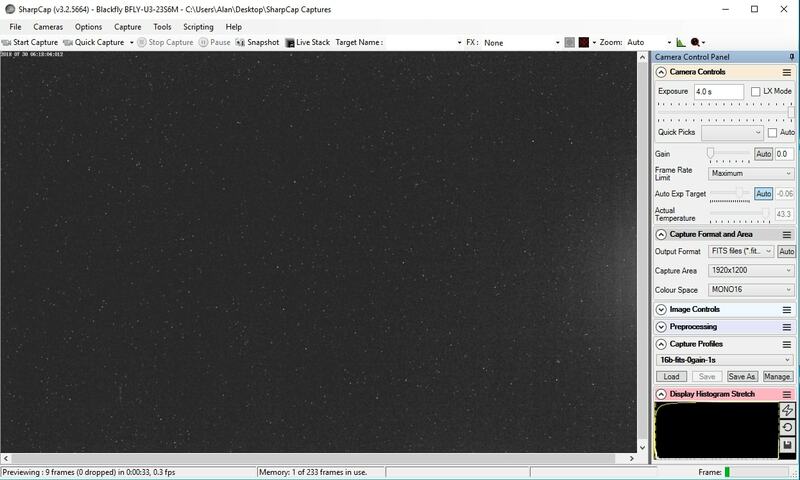 Right now, I have SGP doing that, but if I'm going to capture really short frames (5-10s), I think SharpCap might be better because SGP settles every frame even when not dithering, wasting a lot of time when you're doing very short exposures. Thanks for the feedback - I will look into the folder monitor camera thing where it is not picking up new files. I see your point on the wide monitor issue, but that may have to wait for a later version - I am already trying to get a double view option where the external monitor shows only the stacked image and the main monitor shows the controls *and* a smaller version of the image, but that is proving more troublesome than I expected. Playing with it a bit, the real issue that makes it clunky is I can't "pin" the livestack settings window to anything but the bottom of the screen. If it could "pin" to the side of the Camera Control Panel window, it wouldn't be floating "on top" but rather would force the image view to be a fixed width of the SharpCap window minus the Camera Control Panel window minus the width of the Livestack window. I realize the window settings w/ multimonitor, etc are difficult to code around. Just some feedback for maybe future versions! 5) in the folder, copy the image file and then repeatedly paste it, making 'Image copy.png', 'Image Copy (2).png', etc - these files also get added to the stack with no further intervention needed. This seems to work fine to me and is how I would expect it to work. If you can still make the problem you saw happen, please let me know how the steps to cause it differ from the above steps.